Last year, we saw two films tackle the darkest of moments in American History. Quentin Tarantino’s “Django Unchained” gave us a “what if?” historical satire that was a hit with critics and audiences alike. Steven Spielberg chimed in too with the also acclaimed, though incredibly white washed, “Lincoln,” which depicted the legislative maneuvering that underwent to abolish slavery. With “12 Years a Slave,” we are given the most brutally honest perspective of slavery that may have ever been shown on screen. Steve McQueen brings his interpretation of the real life story of Solomon Northup, a free black man in the North that was kidnapped and sold into Southern slavery. This film was incredibly difficult to watch, not only for the depictions of violence, which are portrayed with unapologetic brutality, but for the painfully honest picture of the treatment of man by his fellow man. Slavery is a topic that is often taught, but never truly understood. McQueen pulled out any hint of humanity and showed the truly despicable evils that happened in America. 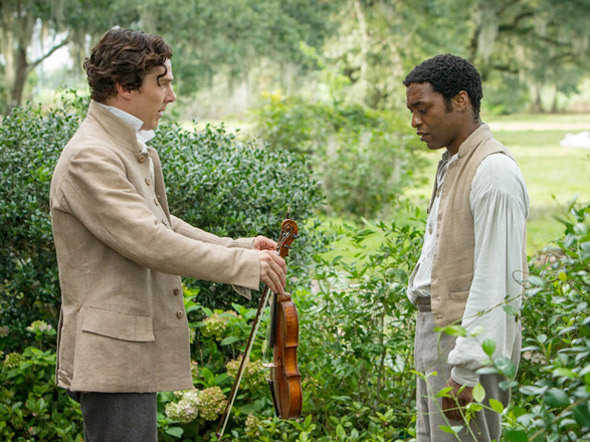 Chiwetel Ejiofor’s performance as Solomon Northup is heartbreaking. We first meet the character as a free man living in normal society, much like we would imagine today, and are quickly taken through his eyes into a hell beyond words, where human life is meaningless and people are treated worse than property, where any glimpse of hope is quickly shattered by reality. We see first hand the evils that so many unnamed lived through. We can almost begin to imagine what it would be like to be torn from our every day comforts and be thrown into an abyss of despair. As painful as this film is, it is equally amazing. Although the subject matter has been taught to us since childhood, the sheer brutality of the truth is often hidden and forgotten. This is a film that is recommendable simply for the experience, but don’t expect to walked out feeling like you “enjoyed a film.” Rather, this should be watched so that we may never forget and hopefully never repeat anything like this horror of our history. This entry was posted on Thursday, October 24th, 2013 at 8:36 pm	and is filed under Film, News. You can follow any responses to this entry through the RSS 2.0 feed. You can skip to the end and leave a response. Pinging is currently not allowed.